Easy Buffing Way To Streak Free Glass. A great glass cleaner is only half the story - a great glass microfibre is essential for getting the job done properly. The Cloudbuster looks like a typical waffle-weave, but the fabric is made with a tougher fabric blend which helps to remove stubborn marks and bonded contaminants. The Cloudbuster is made with a bonded edge, is highly absorbent and is large, making short work of glass cleaning. 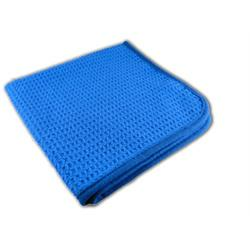 I`m a huge fan of Microfiber Madness products and this one isn`t exception. Cloudbuster simply do the job as advertised. It`s almost as good as special paper towels. And while paper towels are disposable, the Cloudbuster will serve you for a long time. Good product. Don't look at others - buy this! I've found it hard over the years to get a decent glass towel which removes all grime, mist, and glass cleaner. The Cloud Buster does this brilliantly and has firmly positioned itself as my only glass cloth!